Our winter hats series made of fake fur. 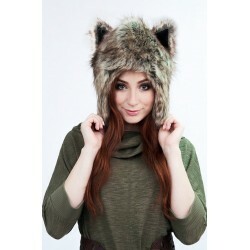 Awesome faux fur hats with mittens and ears, animal-style, soft and comfort. Wolf, Panda, Fox, Raccoon, owl, husky and many other animals are waiting for you. Hats There are 26 products. What is the Beast Hat Snow Wolf?Faux fur, maximum simulates the natural one. We stand for the protection of our younger brothers. Lining - warm fleece. What is the Beast Hat?Faux fur, maximum simulates the natural one. We stand for the protection of our younger brothers. Lining - warm fleece.